To make stuffed squash, or coosa mehshee (MEH-she), the squash has to be hollowed out. 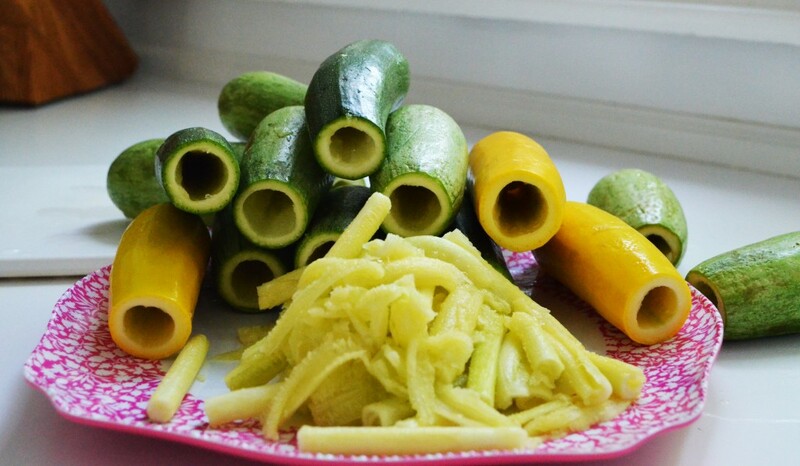 A special tool is used for this, and it’s typically called a zucchini corer. These long metal corers can be found in Middle Eastern markets very cheaply, or online. Is there a makeshift corer you can use? That depends. A melon baller could work, depending on the size of your squash. My melon baller was way too large to core my narrow squash. This dish will be easier, and therefore more pleasurable, to make (and, in turn, more pleasurable to eat) if you go ahead and get the corer. Besides, once you taste the stuffed squash, you’ll want to make it again and again, and then you’ll feel vindicated about having bought another gadget. Cut the top of the squash off (the stem end that was connected to the plant). If your squash is bent at the neck, cut below the bend. You can save any edible portion of the bent pieces; slice them up and sauté them in flash in a splash (I couldn’t resist an opportunity to rhyme on my blog) of olive oil on high heat with a little salt. Delicious. 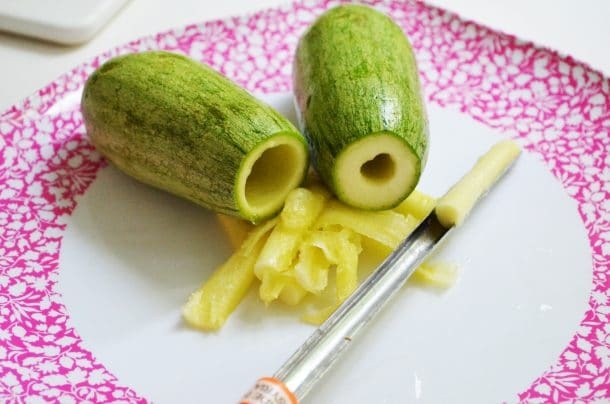 Hollowing the squash is entertaining and easier than it seems, but you have to be careful not to get carried away with how good you are at hollowing it out and puncture through the squash. Take it easy, leaving a ¼ inch rim of squash. Core deep enough into the squash to end up with a decent balance of stuffing to squash. 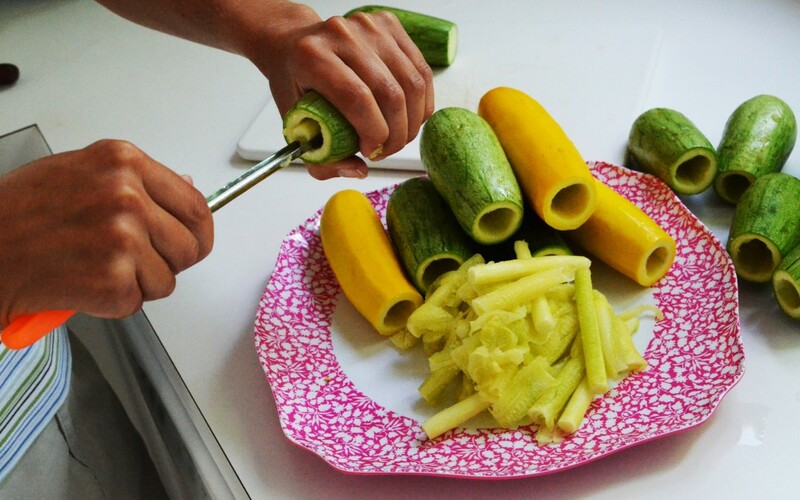 Insert the corer in ¾ of the length of the squash and twist. Pull out the core. Do this a few times, scraping against the edge of the squash with gentle pressure until you’ve hollowed it out. If you do puncture a squash, don’t throw it away in a huff. It’s still useable. Just serve that one, the ugly duckling, to yourself and no one will know. The squash cores are sometimes added into the pot with the coosa when it cooks, and there are other tasty ways to use them up. I don’t add the cores into this dish but if you try it and like it, you get points for wasting not.